WARNER! 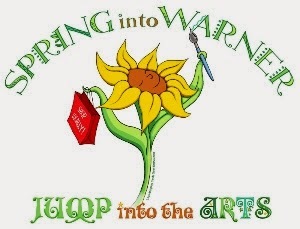 NH: Spring Into Warner - This Weekend! Spring Into Warner - This Weekend! Saturday, May 17, 2014 - 9 a.m. – 3 p.m. Please note that the W.A.R.N.E.R. Group is also having a Raffle of a Basket of goods and Certificates worth several hundred dollars don't miss out be sure to buy your tickets! 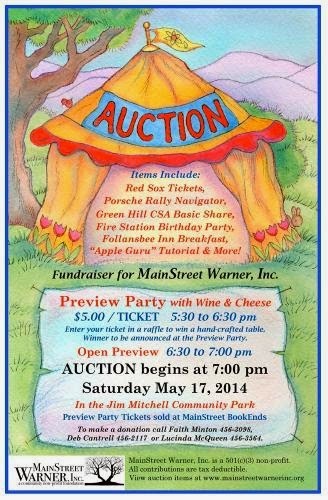 In the evening there will be an auction to raise funds for lighting and sound for the MainStreet Warner Stage in the Jim Mitchell Park. Tickets for the Preview Party at 5:30 pm are $5, and available at MainStreet BookEnds. Preview Party Tickets also will be the Raffle Tickets to win a handcrafted table from Martin Bourque.